Are you Driving the velocity of your Sales Processes with ML? Velocity. That is my word of the day. The velocityof today’s sales and delivery cycles has accelerated to a mind-numbing pace. How are you coping with this velocity? If you are a consumer, you absolutelyrequire fast and dependable deliveries in your Procure-to-Pay cycles. If you are a seller, you absolutely depend on knowing where your customer orders are in the Order-to-Cash cycle. Luckily, there are tools available to you to not only manage but even to acceleratethese end-to-end business process. At SAP, we are using machine learning solutions to help customers accelerate their P2P and sellers to streamline their order to cash process. By leveraging the machine learning capabilities in S/4HANA, sales people don’t have to spend hours every week on numerous spreadsheets to predict the future but rather they can focus on what generates real value. Real-time sales monitoring, analytics and predictions provide insight to sales people to enable faster decisions and actions and to drive your company’s sales performance and efficiency. 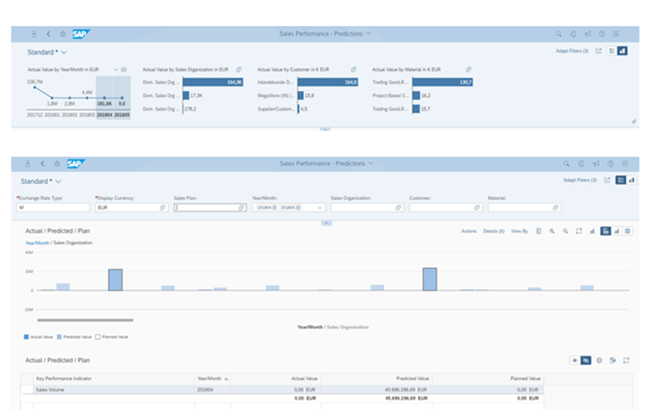 With SAP Sales Performance Prediction – a machine learning solution from SAP – you can compare your achieved sales volume with predicted and planned sales volume in different dimensions (for example, sales organizations, customers, products, etc) and then visualizethe comparison. 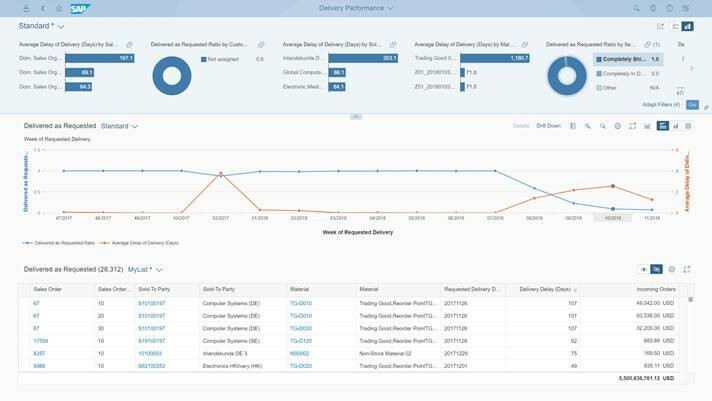 You can gain predictive insights into your current sales performance and simplify your sales planning process. 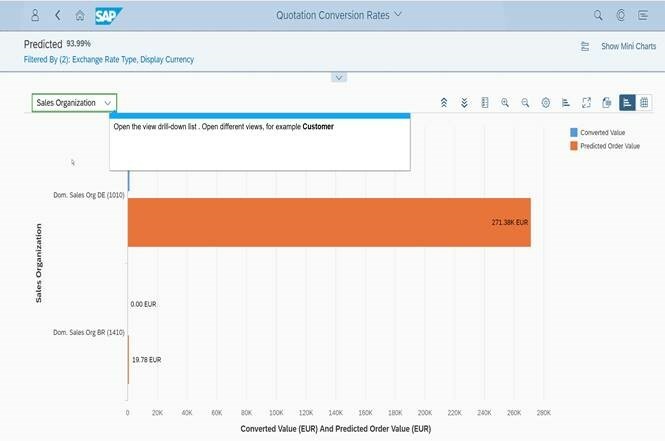 With SAP Quotation Conversion Rate Prediction,you can further predict the probability that a quotation will be converted into a sales order. You can then take actions on the open quotations whichhave the most potential to be converted into Sales Orders. SAP Delivery Delay Prediction provides important insightsinto the fulfillment situation of open sales orders regarding the delivery delay. The system then predicts delays in delivery based on what it has learned from the training of the predictive model. With the help of machine learning algorithms, the system uses past data as a benchmark for comparing the planned delivery date against the confirmed schedule line of sales order items. You can take appropriate actions on influencing criteria of the probable delay. This not only works to help you better predict your deliveries (and ensure that you are delivering on commitments made to customers), it can also help you to accelerate your deliveries by anticipating the “gotcha’s” that inevitably pop up and acting on them before they become problems. Once you have mastered these processes using machine learning, you can master the velocity of your sales cycles and stay ahead of your competitors. We hope that you bring your questions, comments and concerns about how you can accelerate different sales processes like Quotation-to-Conversion and improving stock-outs and backorders using machine learning to SAPTechEd – which is just around the corner in Las Vegas, Bangalore and Barcelona. I’ll be looking forward to speaking with you!